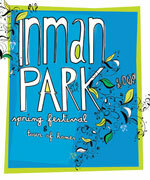 During the last full weekend in April each year, Inman Park in Atlanta proudly presents a neighborhood festival widely regarded as Atlanta’s most spirited and eclectic. Saturday, April 25, 2009, 4:00 p.m. – 5:00 p.m.
Sunday, April 26, 2009, 4:00 p.m. – 5:00 p.m.
Atlanta’s biggest Street Market, offering everything from antique furniture to handcrafted wares. A juried Arts and Crafts Show featuring some of the Southeast’s finest artists. The Festival centerpiece, the Tour of Homes, featuring turn-of-the-century Victorian Painted Ladies and Craftsman bungalows as well as original contemporary designs and loft conversions. Live entertainment, including rock-n-roll, blues, swing, jazz, folk, Western, and beyond. A Dance Festival that showcases some of Atlanta’s best ballet and modern dance companies. Children’s Activities—with a giant slide, cool obstacle course, relays and more. A wide variety of food and beverages on sale throughout the Festival.